Manchester United boss Ole Gunnar Solskjaer is hopeful Jesse Lingard and Anthony Martial will be fit for Sunday's game against Liverpool. 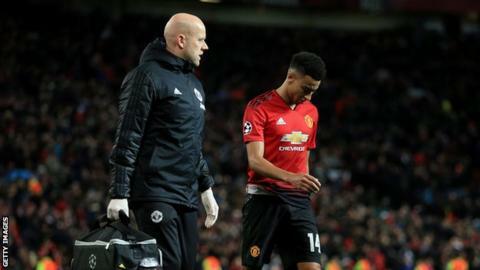 Lingard, 26, injured his hamstring in the Champions League defeat by Paris St-Germain 10 days ago and was expected to be out for up to three weeks. France forward Martial, 23, could also return from the groin injury he picked up in the first half against PSG. "Jesse is looking OK. I hope with Anthony," said Solskjaer. "Anthony's was a different muscle, so we think he might be ready and hope that Jesse will. "We've got two more days so they've got to get through these two sessions. They've not been part of training yet but they've been doing some recovery work." Could Ferguson give United team talk? Solskjaer took over at United after Jose Mourinho was sacked following a 3-1 defeat at Liverpool in December. Since then, United are unbeaten in the league under the Norwegian and have claimed 25 points from a possible 27 to move up from sixth to fourth. The in-form side go into the game against Liverpool on the back of a win at Chelsea in the fifth round of the FA Cup. Former United manager Sir Alex Ferguson was seen chatting to some of the club's players after the match at Stamford Bridge and Solskjaer says he could also speak to the whole squad before the game against the Merseysiders on Sunday. Ferguson won 13 Premier League titles with United, taking their tally of league crowns to 20, compared with Liverpool's 18. "He would be welcome to have his talk to the players if he wanted to, the gaffer, because we know how much it meant for him to overtake Liverpool," said the Norwegian. "I think our players know what it means for everyone at Manchester United." United and France midfielder Paul Pogba was an unused substitute for the defeat at Liverpool but has been an influential figure under Solskjaer, scoring nine goals in 12 games. "He's a top, top player that I've always liked, ever since I saw him as a kid," Solskjaer said. "He's a World Cup winner, he's a leader in the dressing room, on the pitch as well. He wants the ball all the time. "My idea was to get him playing to the best of his abilities, not just him, but I thought he was an attacking midfielder. "You see PSG man-marked him; other teams probably will. "I don't know if Liverpool will. If they do, we will have experienced that because that is what they did and stopped Paul and created space for others. We need to be ready for that."